The Professional’s choice. Invented by Handcraft Collars, Inc. Handmade nylon collar snaps around dog’s neck for a more precise fit. Stays in place and gives the handler better control for more effective teaching. Used by world renowned instructors, and often referred to as the "Volhard" collar. For STRONG, LARGE BREED DOGS, we highly recommend ordering a BOLT SNAP. We have found that the BOLT SNAP is a STRONGER snap when used on the larger, stronger dogs. For Strong small breeds such as Jack Russell, Schnauzers, etc. 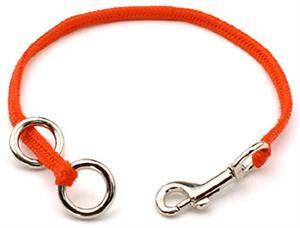 we recommend Stock number 1-143 (large rings, large trigger or bolt snap) for dogs that fit into this size range. Stock number 1-183 (Tiny ring, Tiny Bolt Snap) is available only in a tiny bolt snap. *** Remember, when placing your order for the Snap-Around Training Collar- that an exact measurement is needed. The collars come in whole and half sizes, for example: 12", 12.5", 13", 13.5", etc. When measuring your dog for a Snap-Around Training Collar, place your dog in a standing position. Measure under the chin, around the neck, and then up behind the ears. You want a Snug fit, but not choking. Add an extra ½" for SMOOTH coated dogs, example: Beagles, Boxers, also Setters and Golden Retrievers with silky coats, etc., or 1" for THICK, double coated dogs, example: Huskies, Newfoundlands, German Shepherds, Malamutes, Chows, Samoyeds, Norwegian Elkhounds, ect. to the measurement obtained. This ½" - 1" will give the necessary check with less effort, and will help the collar stay in place. If your dogs coat is kept clipped or trimmed around the neck, only add 1/2" to your measurement. If you are ordering a Snap-Around Training Collar (not an Adjustable Snap-Around), for a LARGE BREED PUPPY, we suggest adding 2" larger to allow for growth. When you get the collar, tie a knot in the center of the collar to take up slack. The knot will take up 1.5" - 2". This will make the collar smaller, and you can get the proper fit you need now while training your puppy. As the puppy grows, let the knot back out to make the collar larger. This will also prevent you from having to purchase several collars while that puppy grows, because LARGE BREED PUPPIES GROW VERY FAST!! The stock numbers for the Snap-Around Training Collar indicates the size rings and snaps we use on that particular size range. This doesn't mean however, that a collar will fit the entire range in each stock number. Your order will be held up if the proper size does not match with the item number. We have the right to correct the item number and pricing to match the size you ordered. Please make sure that the size you order is the correct item number. The images below demonstrate the proper way to measure your pet. The way we measure the finished product after hand making the Snap-Around Training Collar, is by laying the collar flat- straight out- with the stationary ring on the left side, and the snap on the right side, Measure from where the fabric starts on the stationary ring side all the way to the tip of the snap on the other end. We include the fabric and snap only. The stationary ring is not included in the measurement. PLEASE READ OUR "PROPERLY FITTING THE SNAP- AROUND TRAINING COLLAR" IN THE "MORE INFORMATION SECTION" ON HOME PAGE. Also available are matching Leads in all materials mentioned. Please refer to our Lead pages for pricing and lengths. 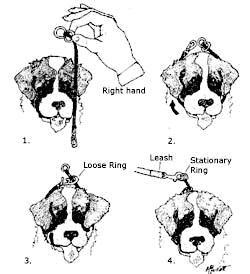 See illustrations below for proper way to place the Snap-Around Training Collar on your dog. 1. Collar has one stationary ring, a floating or loose ring, and a snap. Your RIGHT hand will be holding the end of the collar with the two rings as shown in the illustration below. Your LEFT hand will be holding the end of the collar with the snap. 2. 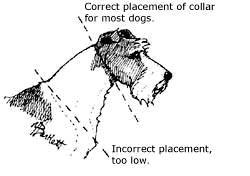 Place snap end of collar under dogs chin, behind ears, and around neck. Bring ring end of collar around chin to other side of dogs neck. 3. Attach snap to floating or loose ring. The collar will form a " P " when placed around the dog's neck correctly. The collar will not release properly if the collar is not placed around the dog's neck correctly. 4. Attach leash to stationary ring. For the past 15 years we have given each of our students these collars free with their registration. They are strong and effective and are the only ones we use and recommend. Our students rave about the control they achieve with very little effort. This is the best collar for obedience training! I had never known of this type of collar before, and decided to purchase two of these training collars for my two dogs. I got amazing results when I used the collars on them, and it seemed that once I hooked the leash to the collar, they knew immediately what was expected of them! Had to use very little effort. I highly recommend the Snap-Around Training Collar! "I have two APBT who are very active strong working dogs so I needed a good control collar. A friend let me borrow his Snap- Around collar and I couldn't believe how easy it was to get my dogs to settle while wearing it. It takes a minimal correction to get them in a heel, and I prefer it over a pinch in most casses. I will start to recommend it to friends!"